At first, it seemed like I’d gotten off pretty easy for Valentine’s Day. My good friends from high school had been complaining about the Valentine sweat shops that they were forcibly running for their own children who are slightly older than Henry, but it was seemingly going unnoticed in our pre-school. All I did was order a heart-shaped stuffed pizza for my Chicagoan mate, and have it shipped on dry ice. Baby Ivy and I brought home a dozen hot pink roses for the y-chromosomes in our lives. It was about all I could muster at this juncture: Ivy was only 3 weeks old and Henry’s 3rd birthday is the day after Valentine’s Day. In other words, in addition to the Valentine kerfuffle we were trying to celebrate in other ways. Low key ways, perhaps, but ways. But then, one of the parents from one of the other preschoolers in my son’s class emailed the class on Tuesday or Wednesday night of Valentine’s week and suggested that it would be fun to bring in Valentines on Friday, and did anyone else want to do that? Many of the crafty mommas in our group replied and said yes. Everyone is so much more cheerful and together than I am, I grimly thought. I didn’t respond, but it’s not like I wasn’t going to do it. It’s not like I wasn’t worried about getting it done. A few days pass. Thursday night after a family trip to the Brooklyn museum, the Valentine deadline looms closer and darker than ever, like a storm two blocks over but cruising quickly towards our building. It was clear that we needed to start. I’d been thinking that we just needed a stencil of a heart on some construction paper and that we could fill in the inside with glitter glue, but then a more involved idea started to develop. 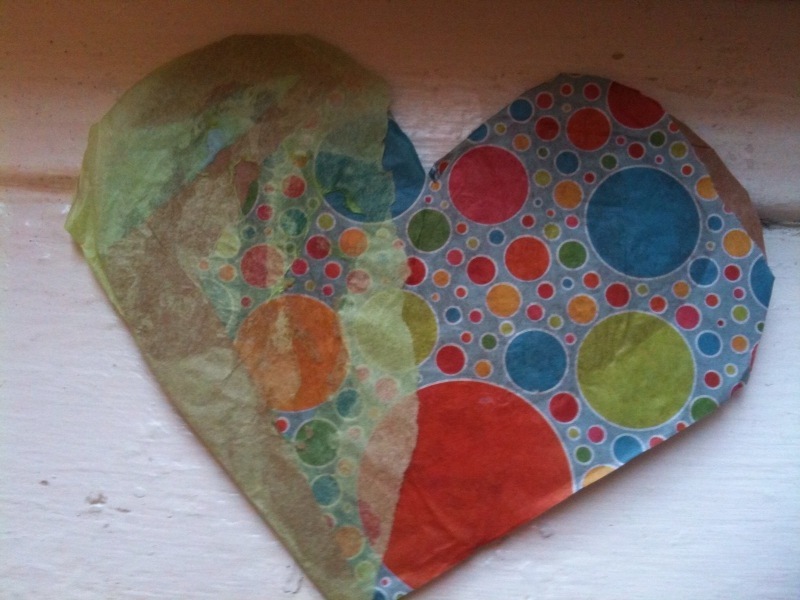 Perhaps inspired by our trip to the museum, I decided that we should cut out cardboard hearts out of a corrugated cardboard box we have, and then glue colorful tissue paper we have in the recycling bin to the hearts. Surely some lightly decoupaged cardboard hearts made from recycled materials would be acceptable Valentines in this DIY, green, and Etsy-ish era, right? So while we are all at the kitchen table that evening, me sitting around nursing the baby, Matthew paying bills, and Henry futzing around with Legos or playdoh or something else I don’t remember, and no one at all making dinner, I look up decoupage on my old friend The Internet. I quickly find a pdf that explains the procedure. I was nearly ready to steward the Valentine-making project, but I needed some tips. I had only managed to read that decoupage was a process whereby a person could afix some things to some other things when I started to share my ideas out loud, an act which I would immediately regret. “I saw that you looked up decoupage,” he teases. I gaze at him, weighing whether I should point out that it lies wholly within the realm of possibility that I would look up tracing my own hand on the Internet, realizing that such information might cause me further trouble. Anyhow, while I am plotting the Valentines but have a suckling Ivy in my arms, my husband decides that he will grab the reins and start to make the Valentines out of construction paper, running with the original glitter glue idea, sans the heart stencil, forgoing my complex and yet somehow delicious plans of decoupage. But I don’t want construction paper valentines anymore. I want good ones. I will settle for nothing short of Florentine-style crafts made from locally sourced recycled materials. The hardest part about decoupaging Valentines turns out to be cutting out the corrugated cardboard hearts. The 3 year old is really happy to tear up tissue paper and smear glue around. The baby is happily oblivious enough to marinate in a thin coating of Elmer’s; in the way of newborns, she is, quite frankly, always developing some sort of white crusty stuff all over her, anyhow. And after an initial tug of war over who will do the Valentines, the husband is willing to let me torture myself and Henry while he heats up the leftover Chinese food for us. I finally have enough cardboard hearts cut out. We make a few Valentines and it works out well. I love the way they look. A challenge comes when Henry decrees one Valentine to be for the tooth fairy rather than for the classmate we’d set out to make it for. And then the next one we make, he likes so much that he refuses the idea of giving it away. He also screams about it a whole lot. The one we couldn't give away. And then we get into an argument about whether he will get up and hand me the next heart to work on. And then dinner is ready and my husband wants to clear the table. But there aren’t that many kids in the class and we get them done. And the next morning when I get up and wander blearily into the kitchen, baby (still? again?) in my arms, it is my husband sitting at the table decoupaging the world’s most perfect and lovely Valentine, far nicer than the ones I’d thrown together. And who is it for? Being valentines: it can be just about as easy as tracing your own hand. Epilogue: The people who suggested that we make Valentines for school? They did not bring Valentines. Shall I share my childhood Valentine’s Day trauma story? Yes, I shall. It was first grade. Mrs. Ranny. Along with my mother, I had spent much of the fall in and out of Mass General in Boston receiving PUVA treatment for our shared skin condition (polymorphic light eruption). Google if you like. I was feeling a little socially awkward from missing so much school. And generally raw, as one does when one is seven and is covered in an itchy, red rash. So Valentine’s Day rolls around. I decided that I would be hypocritical to give Valentines to kids I felt I did not know at all(which felt like half the class). A Valentine seemed somewhat intimate – it was all about love, right? I thought it would be better to give no Valentines at all than to only give ones to the kids I knew, so that no one felt left out. The day came. I sat in my desk while other kids put Valentines in my little the pouch we had each made for the purpose of receiving Valentines. Mrs. Ranny called my name and took me out into the hallway. She berated me for not bringing any Valentines for the class and said that I had hurt my classmates feelings. She said I should make it up to the class in some way. She left me sobbing in the hallway to contemplate my grand faux pas. I was mortified. Here I thought I was being so egalitarian, but I had really just fucked up. St. Patrick’s Day came around and I thought it might be an opportunity to redeem myself. I had feverishly traced with thick black marker and cut (in total anxiety) about 15 shamrocks out of green construction paper before my mother came into my room and asked what I was doing and why. I explained. Now my memory fails me. Did my mother tell me that I didn’t have to do this, that it was wrong, and I went out to play; or did I slip an apologetic shamrock onto each classmates’ desk? I have both images in my mind. I’ll choose the former. Thanks, Mom. That woman had no business teaching children. Ugh, you poor thing. I think valentines are nice, but can be fraught, and any adult who makes it worse should be dopeslapped. Love this post! What a sweet story. I feel like I was right there in your kitchen. I could smell the Chinese leftovers. Hope to see you soon.